Badger Lake: From the city of Kamloops, travel north on Hwy. #5 for 22.5 km (14 mi). Turn east (right) onto the Heffley-Louis Creek Road and travel for 8 km (5 mi). Turn north (left) onto a secondary road which will take you past Sullivan (Knouff Lake) and Little Knouff. Badger can be found a few kilometers north of Little Knouff Lake. Badger can, and has in the past, produced large Rainbows in the 10 lb class, however trout up to 3-1/2 lbs are the norm these days. Bare Lake: Bare Lake is a fly-in lake located approximately 53 kms (33 mi) northwest of Kamloops. Bare Lake offers a very good rainbow fishery with trout in 1/2 lb to 2 lb range. Beaverdam Lake: Turn north (right) on Hwy #97 and travel through the community of Clinton. Turn west (left) on a secondary road about 16 km (10 mi) past Clinton. Follow this road to Beaverdam. Beaverdam is a shallow lake that provides a good Rainbow and Brook trout fishery during spring and fall months but it's ice fishing for Brookies up to 4 lbs that attracts most of the attention of fishermen. Big Bar Lake: From Kamloops take the Trans Canada Hwy (Hwy #1) west to the community of Cache Creek. Turn north (right) onto Hwy #97 and travel through the community of Clinton and turn west (left) on Big Bar Lake Road. Travel west until you arrive at the Big Bar Lake Provincial Park campsite. Big Bar Lake has good rainbow fishery with trout reaching up to 5 lbs. Big Ok Lake: Travel straight at the intersection of Hwy 97c passing by the Highland Valley Copper mine and the Tailings pond. Turn left onto the Laura Lake road at the intersection with Landon road. The pavement ends here and from this point on the road passes through Highland Valley Copper mine property. Managed as a quality lake Big Ok produces rainbows 3lbs and larger, by larger is meant that 8lbs and up is not unheard of in this lake. Bonaparte Lake: Bonaparte is located approximately 65 km ( 40 miles) southwest of l00 Mile House. Follow Hwy 24 to the Bridge Lake store, turn right (south) on to a gravel road (stay left at the Y) which will take you to Eagan lake. Just past Eagan, take the left road at the Y and follow it to Bonaparte. Bonaparte is capable of producing rainbows in the l2lb range with 3 to 4 lb trout being the norm. Small kokanee are also around. Bulman Lake: From the city of Kamloops take Hwy #5A south for about 38 km (23.6 mi). Turn east (left) onto the Roche Lake Road and travel 11 km (6.8 mi) to Roche Lake. Bulman is located a few kms southeast of Roche Lake. Managed as quality water, Bulman is a wonderful lake that often produces rainbows in the 4-1/2 lb range. Calling Lake: Travel straight at the intersection of Hwy 97c passing by the Highland Valley Copper mine and the Tailings pond. Turn left onto the Laura Lake road at the intersection with Landon road. The pavement ends here and from this point on the road passes through Highland Valley Copper mine property. Calling Lake can produce rainbows to 3 lbs and larger. Chataway Lake: From Merritt head west to the village of Lower Nicola. Chataway is located north of Lower Nicola and is accessed via several well marked gravel roads. Rainbows in Chataway Lake will range from very small to 5 lbs. Community Lake: Turn east (right) onto the Heffley-Louis Creek Road. Turn north (left) onto a secondary road. A few kilometers before reaching Sullivan Lake, you will find another road that branches to the east (right). Follow this road to Community Lake. Community is managed as a quality lake and is a good producer of Rainbows to 3 lbs. Corbett Lake: Corbett is located on the left hand side of hwy 5A to Princeton approximately 18.4 kms (11.4 mi) southeast from the centre of Merrit. Corbett is a consistent producer of rainbows in the 1 lb range with some going to 3 lbs or larger. Dairy Lake: The Dairy Lake area can be accessed by turning south (left) off Hwy #1, 8 km (5 mi) west of Hwy #5 and Hwy #1 interchange, onto the Greenstone Mountain Road. Stocked with Rainbows annually, these trout will often reach 3 lbs or larger. Because of its elevation, Dairy Lake fishes well throughout the summer months. Dunn Lake: This long, deep lake can be found via the Dunn Lake Road just east of Little Fort. The scenic lake offers fishing opportunities for rainbow trout, lake trout, bull trout and the odd Kokanee. Fatox Lake: From Kamloops travel west on Hwy. #1 (Trans Canada Hwy.). Travel past the community of Savona. You will cross two rivers. The first river you will cross is the Thompson River. The second is a small river called the Deadman River. After you cross the Deadman River, you will start climbing a hill, near the top of the hill turn north (right) off Hwy. #1 onto a secondary road (Deadman Creek Road) which will take you to several lakes including Fatox. Fatox is reported to be a good producer of Rainbows that reach into the 3 lb. 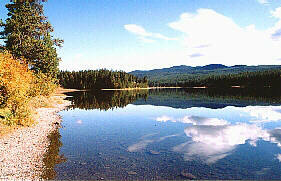 Gorman Lake: Located 15 km (9.3 mi) northwest of the community of Barriere. Gorman Lake consistently has good rainbow fishery throughout the season. Trout will reach an average size of 2 lbs. Hallamore Lake: Located northeast of Little Fort and southeast of Clearwater on the Dunn Lake Road, Hallamore produces a good number of rainbow trout and offers the opportunity to explore many excellent fishing lakes in the surrounding area. Heffley Lake: Located 44 km. (27 miles) northeast of the city of Kamloops. From Kamloops travel north on Hwy #5 (Yellowhead Hwy.) for 14 miles. Turn off at the Sun Peaks Ski Resort exit and stay on this road (Heffley Louis Creek Road) for 13 miles. Helmer Lake: From the city of Kamloops travel west on Hwy. #1 (Trans Canada Hwy.) for 11.4 km (7.1 mi). Turn south onto the Coquihalla Hwy (Hwy #5). Take the Helmer exit off Hwy #5 and turn west (right) and travel a short distance to the lake. Action at Helmer Lake can be fast and furious for small Rainbows up to 1 lb. HiHium Lake: From Kamloops take the Trans Canada (hwy #1) west for 75 kms. (46.5 miles) to the community of Cache Creek. Turn north (right) onto hwy. 97 and travel 32 kms. (19.8 miles) to 20 Mile House and turn east (right) onto Loon Creek road. Drive approx 39 kms, passing along Loon Lake and on to the junction of the 3400 Road. Turn right onto the 3400 Rd and travel south east for approx 22 km (13.6 miles). Watch for signs to access the HiHium Lake South Recreation site. Turn right at the access road. Follow this road for 2 kms. (1.2 miles) to the recreation site at the southeast end of HiHium Lake. Hyas Lake: From Kamloops travel north on Hwy #5 (Yellowhead Hwy) for 5 km (3.1 mi). Turn east (right) onto the Paul Lake Road. Stay on this road until you reach a secondary road just past Pinantan Lake. Turn north (left) and travel to Hyas Lake. In its earlier days, fishing at Hyas was superb. Large Rainbows up to 16 lbs. were caught. Today, these huge fish are gone, however Hyas still supports a good Rainbow fishery with trout going up to 3-1/2 lbs and the occassional one up to 5 lbs. Jacko Lake: From Kamloops head west on the Trans Canada hwy (hwy #1) for 11.4 km (7.1 mi). Immediately after leaving Kamloops turn south (left) onto the Lac le Jeune road. Stay on this road until you reach Jacko Lake turn off. Jacko was once legendary for huge fish, it now produces catches of rainbow up to 4 lbs. Janice Lake: At Little Fort, turn west on hwy 24 and drive 22.5 km (13.9 mi). Turn left into the Long Island (Janice) Lake forest service recreation site road and travel 500 m (1640 ft) into the campsite. Janice is a very good fly fishing lake with rainbows in the 3 lb range and some going much larger. Kamloops Lake: This beautiful lake is right along the Trans Canada Highway (Hwy # 1), approximately halfway between the city of Kamloops and the community of Cache Creek. Access to the lake is available from Savona and other points along the miles of lakeshore. Kelly Lake: From Clinton turn left (west) on the Kelly Lake Road. Kelly is situated in Downing Provincial Park. (about 10 km/6 mi southwest of Clinton). Rainbow Trout are the Game Fish in Kelly Lake. Lac Des Roches: Lac Des Roches is accessible by taking the Yellowhead Hwy north from Kamloops and then turning left (west) onto Hwy 24 at Little Fort. Trolling for rainbows up to 7 lbs seems to be the preferred method on Lac Des Roche. Lac Le Jeune: Turn onto the Coquihalla Highway (hwy #5). Take exit 336 off hwy 5 and drive northeast a short distance on the Lac le Jeune road. Turn right at the Lac le Jeune sign post and follow either to the provincial park or to the resort area. Approximately 35 km (22 mi) from Kamloops. Lac le Jeune is a very popular family lake offering a good rainbow fishery, up to 3 lbs. Latremouille Lake: At Little Fort turn west (left) onto Hwy #24. Follow Hwy #24 for about 20 km (12.5 mi). Watch for the Latremouille Lake turn-off which is located south (left) off Hwy #24. Good, consistent fishing for Rainbows up to 2-1/2 lbs at Latremouille Lake. Little Heffley Lake: From the city of Kamloops travel north on Hwy #5 (Yellowhead Hwy) for 22.5 km (14 mi). Turn east (right) onto the Heffley-Louis Creek Road. Little Heffley Lake has good Rainbow fishery producing consistent fishing for Rainbows up to 2-1/2 lbs. Loon Lake: From Kamloops take the Trans Canada (hwy #1) west to the community of Cache Creek. Turn north (right) onto Hwy 97 and travel 32 km (19.8 mi) to 20 Mile House and drive 17 km(10.5 mi) to the southwest end of Loon Lake. Loon Lake provides excellent rainbow fishery up to 1.5 kg. Machete Lake: At 93 Mile, turn east off Hwy 97 on to Hwy 24. Follow Hwy 24 past the turn off to the Bridge Lake Store. Continue east for another 4.5 km (2.8 mi) and turn right (south). Continue on this road for 18.6 km (11.5 mi) to the lake. Machete Lake has rainbows in the 2 lb range. McConnell Lake: From Kamloops travel west onto the Trans Canada (hwy#1) for 11.4 km (7.1 mi). Turn south on the Coquihalla hwy (hwy #5). Take exit 336 off of Hwy 5 and drive northeast on the Lac le Jeune road for 9.6 km (6 mi). Turn right to McConnell Lake boat launch. McGillivray Lake: From Kamloops travel north on Hwy #5 (Yellowhead Hwy) for 22.5 km (14 mi). Turn east (right) onto the Heffley-Louis Creek Road. Follow this road past Heffley Lake and east to McGillivray. McGillivray provides a good Rainbow fishery for trout up to 3 lbs. Meadow Lake: At Little Fort turn west (left) onto Hwy #24. Access to Meadow is via TaWeel Lake Road off Hwy #24. Meadow Lake has fair to good fishing for Rainbows up to 4-1/2 lbs. Monticola Lake: At Little Fort turn west (left) onto Hwy #24. Stay on Hwy #24 until you get to TaWeel Road. Turn north (right) onto TaWeel Road and drive north until you get to Blowdown Road. Turn west (left) on Blowdown Road and drive to Monticola Lake. Monticola Lake is a rainbow stocked lake with an abundance of insect and shrimp life offering fair catches of trout up to the 2 lb range. Nicola Lake: Located 10 km (6.2 mi) northeast of the town of Merritt via Hwy #5A. Access from the city of Kamloops is also via Hwy #5A. Nicola supports a fair Rainbow and Kokanee fishery throughout the season. Rainbows go to 4 lbs while Kokanee remain in the 1 lb class. Niskonlith Lake: Cross over the South Thompson River via bridge at Chase and travel west for about 11 km (7 mi) on a secondary road following the river. Turn right and follow this branch road to Niskonlith Lake. Niskonlith provides a good fishery for Rainbows in the 1-2 lb range and Kokanee in the 1 lb class. Paska Lake: From the Coquihalla (hwy #5). Take exit 336 and turn west (right) on the Lac la Jeune road heading south to Surrey lake, you will come to the Paska lake road. Rainbow trout are the game fish in Paska Lake. Pass Lake: From North Kamloops take the Lac du Bois Road to Pass Lake. Managed as a quality, fly-only lake, Pass provides patient fly fishermen with a fine Rainbow fishery that produces trout up to 6 lbs and larger. Paul Lake: From the city of Kamloops travel north on Hwy #5 (Yellowhead Hwy) for 5 km (3.1 mi). Turn east (right) and travel on Paul Lake Road to Paul Lake. Paul has in the past been one of the truly fabulous fishing destinations. Today, even though it receives heavy use, Paul remains a very good lake. Rainbows go to an average of 3-1/2 lbs. Peterhope Lake: From the city of Kamloops travel south on Hwy #5A. The turn-off to Peterhope is found just past the south end of Stump Lake. Turn east (left) on this secondary road and follow it a few km to the lake. Peterhope is on the rebound and things are starting to look bright again. Managed as a quality water, fish up to 12 lbs are being caught by experienced fishermen, however trout in the 5 lb range are the norm. Pimainus Lake: Travel straight at the intersection of Hwy 97c passing by the Highland Valley Copper mine and the Tailings pond. Turn left onto the Laura Lake road at the intersection with Landon road. The pavement ends here and from this point on the road passes through Highland Valley Copper mine property. A left turn will lead you to Pimainus Lake. Pimainus lake contains large numbers of wild rainbows in the 1 to 2 lb range. Pinantan Lake: Turn off to the east (right) onto the Paul Lake road. Stay on the Paul Lake road until reaching the Pinantan Lake road and turn left onto the Pinantan Lake road. Pinantan is an excellent family lake producing well throughout the season. Rainbows in the 1 lb range. Plateau Lake: From the city of Kamloops, travel south on Hwy #5A until you reach Stump Lake. Access to Plateau is from the north end of Stump. Plateau Lake is located to the southeast of Stump. Plateau is capable of producing large Rainbows up to 10 lbs, but trout in the 3-4 lb range are more the norm. Roche Lake: From the city of Kamloops take Hwy. #5A south for about 38 km (23.6 mi). Turn east (left) onto the Roche Lake Road and travel 22 km (6.8 mi) to the lake. Roche is a consistent producer of rainbows in the 2-4 lb range. Larger trout up to 12 lbs have been caught in this lake. Rose Lake: From the city of Kamloops travel south on Hwy #5A for about 38 km (23.6 mi). Turn east (left) onto the Roche Lake Road. Rose is found roadside on the way to Roche. Rose is a small lake however it provides fishermen with a good Brook trout fishery. Sharpe Lake: Follow Hwy 24 to the Bridge Lake Store, turn right (south) onto a gravel road and stay on the left branch of the fork. Follow this road until you reach Eagan Lake at which time you take the right branch of the fork. Sharpe is found on your south (left) side. The Game Fish in Sharpe Lake are rainbow trout. Shuswap Lake: Shuswap Lake, "The Houseboat Capital of Canada" is a mecca for swimmers, waterskiers, fishermen, nature lovers and boaters alike with it's 1000 km (620 miles) of beautiful shoreline, sandy beaches and marine parks. Stake Lake: From Kamloops travel west on the Trans Canada Hwy #1 for 11.4 km (7.1 mi). Turn south on the Coquihalla Hwy #5 Take exit 336 off of Hwy 5 and drive northeast on the Lac le Jeune road. A very popular lake, Stake is rainbow stocked and is considered a very good fly fishing lake with a good sedge hatch. These rainbows go to 2 lbs. Stump Lake: From the city of Kamloops take Hwy #5A south and travel for 40 km (24.8 mi) to Stump Lake. Stump Lake was once famous for its huge trout of 15 lbs or better, this moody lake still produces large fish in the 6 lb range. Sullivan (Knouff) Lake: Turn east (right) onto the Heffley-Louis Creek Road and travel for 8 km (5 mi). Turn north (left) onto a secondary road which will take you to Sullivan (Knouff) Lake south of Badger. Knouff provides a good fishery for Rainbows up into the 3 lb class, however fish have been caught in the 12+ lb range. TaWeel Lake: At Little Fort turn west (left) onto Hwy #24. Follow Hwy #24 to Lemieux Creek Road. Turn right onto Lemieux Creek Road, following it all the way to the southeast end of TaWeel. Quality fishing for rainbows up to 4 lbs and larger makes TaWeel a definite stopover. Thuya Lakes Area: At Little Fort turn west (left) on Hwy 24 and drive for about 15 km(9.3 mi). Thuya Lake access road is found on the south (left) side of Hwy 24. Thuya Lake has excellent rainbow fishery that produces well right through the fishing season. Fast action for rainbows that range from small up to the 6 lb class. Tunkwa Lake: At Logan Lake, watch for the turn off to Tunkwa and Leighton Lakes on your right hand side. Tunkwa Provincial Park is found 14.5 km (9 mi) north of Logan lake. Tunkwa produces good catches of rainbows up to 4 lbs and better. Tyner Lake: From Merritt head west to the village of Lower Nicola. Tyner is located north of Lower Nicola following the road leading to Pimainus Lake. Tyner Lake provides a good fishery for Rainbows up to 3+ lbs. Walloper Lake: From Kamloops travel west on the Trans Canada Hwy #1 for 11.4 km (7.1 mi). Turn south onto the Coquihalla Hwy #5. Take exit 336 off Hwy 5 and drive northeast a very short distance 1 km (.6 mi). Turn south (right) and follow this road to the boat launch. Walloper Lake is a great family lake offering a large abundence of trout that average in the 1 lb range with the odd one reaching 4 lbs. Warren Lake: Warren Lake is approximately 1 km (.6 mi) west of Pemberton Lake. Warren provides the fly fisherman an excellent Rainbow fishery with trout reaching into the 5 lb class. White Lake: White Lake has crystal clear water, large areas of marl shoals and Rainbow Trout known to exceed ten pounds. The combination of those attributes will often inspire a fly fisher to dreams. Dreams of fishing that ideal lake thought to only exist in mythology. White isn't that perfect lake but it comes pretty close and is an excellent choice for a weekend of fly-fishing. Young Lake: At 70 Mile House turn east onto the Green Lake road. Continue for 26 km. (l6 miles) following the south road. Turn right and continue for about 9 km. (5.6 miles). Stay on the right fork about 1.3 km. (.8 miles) after the last turn. Continue for about l km. (.6 miles) and take the left fork marked as Young Lake Road East. Continue for 4.l km. (2.5 miles) and make a right turn on to a " no through road ". The north side of the lake near the mid point is about 1/2 km. (.3 miles) beyond the last turn. Rainbows up to 4 lbs. can be caught in Young Lake.